This is from Sue Light’s excellent blog which gave me lots of background to the medical situation in WW1. 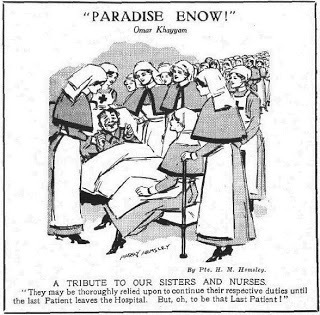 See http://greatwarnurses.blogspot.co.uk/. “I’m a great reader of crime fiction, often to the exclusion of doing other, more important things. On the whole I stick to British authors, like complex plots, skip over too much gratuitous violence, and prefer to arrive at the end actually understanding what’s gone on in the middle. So about eighteen months ago I was intrigued and rather flattered to be asked by Robert Ryan if we could meet up to discuss a new book he was working on (these days a bit of flattery is so very welcome). He intended to include ‘some plucky VADs’ and wanted to make sure that they would be appearing all present and correct. Over the next months I was kept up to date with the progress of the book and then asked to check the first draft to see how the VADs were doing. Anyone who has read this blog on a regular basis will know that of all the bees that float around my bonnet, the indiscriminate placement of VADs in Casualty Clearing Stations on the Western Front is the one that stings hardest, and in this book their inclusion in very forward areas was going to be essential to the plot. If I have learned one lesson from the exercise, it’s this. If you’re a writer of fiction and make fundamental errors because of inadequate research and blissful ignorance, the wrath of pedants will be unleashed upon you. On the other hand, if you include factual inaccuracies and weave them in an intelligent way, in full knowledge of your sins, you will always be forgiven (fingers crossed). 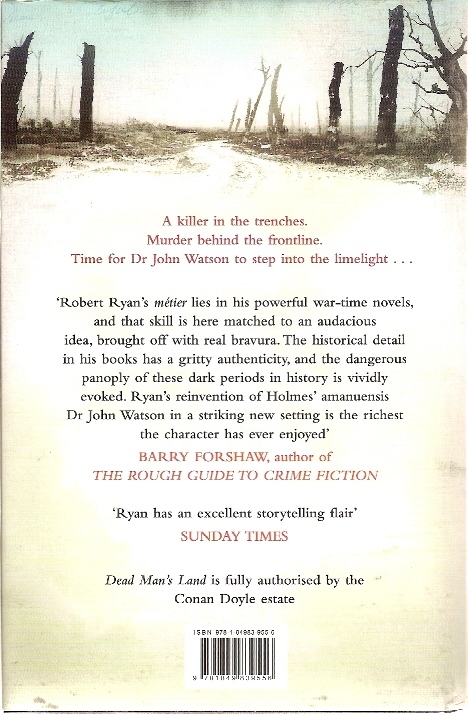 Dead Man’s Land was published at the beginning of this month with the full approval of the Conan Doyle estate. It follows Dr. John Watson’s travels around the Western Front during the Great War, and where Dr. Watson goes, death and intrigue are right on his heels. By most estimations he must be getting on a bit in age, but his physical limitations are highlighted, not glossed over, and his place as an elderly medical practitioner in wartime never seems extraordinary. The military setting is sound, and the depiction of hospitals and casualty clearing stations in wartime is thorough. The VADs are skilfully introduced into a place where they would never actually have been, with the difficulties and regulations surrounding their employment made clear. Even I was heard to clap. The story is unusual and absorbing, it has complexity, but with enough clarity to prevent it becoming confusing, especially for those who don’t usually dabble in ‘war,’ and it should appeal to everyone who enjoys crime fiction of any era, but perhaps especially to devotees of Sherlock Holmes. Yes, of course he’s there as well. This entry was posted in Books and tagged nurses, Sherlock, Watson, WW1 on February 2, 2013 by Robert Ryan.